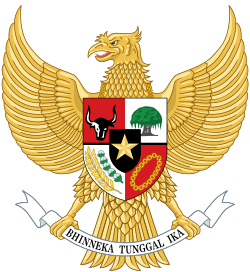 The General Elections Commission (Indonesian: Komisi Pemilihan Umum (KPU)) is the body that organises elections in Indonesia. Its responsibilities include deciding which parties can contest elections, organising the voting and announcing the results and seats won in the various branches of the government. Following the fall of President Suharto and the end of Indonesia's authoritarian New Order, as a result of public pressure, President Habibie brought forward the general elections planned for 2002 to 1999. On 1 February the People's Representative Council passed Law No.3/1999 on the General Election, which mandated the establishment of a "free and independent General Elections Commission comprising members of political parties and the government" to oversee the elections. The commission was then established with 53 members and former home affairs minister Rudini as chair. As a result of further public pressure, the government appointed five independent people as its representatives, including noted human rights lawyer Adnan Buyung Nasution. Other independent members included former Supreme Court judge Adi Andojo Soetjipto and political commentator Andi Mallarangeng. The 1999 elections were held on 7 June, and were a success thanks to the management of the KPU, although 27 of the 48 parties contesting the election (all but one of which won less than 0.7% of the vote) refused to sign the KPU document reporting the results. The KPU passed the problem on to President Habibie, who declared the results valid on 26 July. These members, minus Syamsul Bahri, who was facing legal problems, were appointed on 23 October 2007. Andi Nurapti left the KPU in 2010 after becoming an official of the Democratic Party, and was replaced by Saut Hamonangan Sirait. The seat of the Indonesian General Elections Commission is located in a building at Jalan Imam Bonjol 29. The building, designed by architect A.W. Gmelig Meyling, was completed in 1955. The building was among the first post-war architecture of Indonesia and was described as "impressive" at its completion. The building was originally used for the Pusat Perkebunan Negara (Ministry of Agriculture) office. ↑ Merrillees 2015, p. 47. Abdullah, Taufik (April 2009). Indonesia: Towards Democracy. Solo: Institute of Southeast Asian Studies. ISBN 978-981-2303660. Manning, Chris; van Dierman, Peter (April 2000). Indonesia in Transition: Social Aspects of Reformasi and Crisis. Institute of Southeast Asian Studies. ISBN 978-1856499248. Puspoyo, Widjanarko (December 2012). Dari Soekarno Hingga Yudhoyono, Pemilu Indonesia 1955 - 2009 (From Soekarno to Yudhoyono. Indonesian General Elections 1955 - 2009). Solo: Eka Adicitra Intermedia. ISBN 9786028237970. "Profil Komisi Pemilihan Umum (Profile of the General Elections Commission)" (in Indonesian). KPU. Retrieved 25 March 2014. "Profil Anggota KPU RI Periode 2012 - 2017 (Profile of KPU Members for the 2012-2017 Period)" (in Indonesian). KPU. Retrieved 25 March 2014.